The Task Force Workshop held on Tuesday 8 May was well attended. Gabriele Dasse welcomed the participants and gave an overview about the Task Force activities. The 10th issue of the Task Force Newsletter was distributed by the Task Force Chair. One of the Task Force's charges is to support and encourage female and young surveyors as well as for example linguistic or cultural minorities within the FIG community. During the Workshop the participants discussed in which way the attendance for minorities in or entering the disciplines of surveying at the FIG Congress 2002 in Washington could be facilitated. Mary Clawson, Congress Director, gave the information that there is a special low registration fee for students and also a lower registration fee for speakers. In addition also low-cost accommodation is available in Washington, DC. It was proposed to write an e-mail on behalf of the FIG Task Force on Under-represented Groups in Surveying to Member Associations, Affiliates, Academic Members, Corporate Members, Correspondents, Council Members, Officers of Commissions and Permanent Institutions, Honorary Presidents and Honorary Members to ask for assistance to support and encourage the Under-represented Groups in Surveying to attend the FIG Congress 2002 in Washington, DC and to give presentations. In the meantime an e-mail of the Task Force Chair was distributed by Markku Villikka, Director of the FIG Office. The Task Force Chair together with John Parker, Chair of FIG Commission 1 (Professional Standards and Practise) and Kirsi Virrantaus, Chair of Commission 2 (Professional Education) agreed upon 2 joint sessions. The Task Force and Commission 1 would like to discuss "The Informal Ways to Surveying". Mary Clawson suggested and the participants agreed that after this session there should be a second one with a plenary discussion instead of a separated meeting of Task Force members and members of the "Forum of Equal Opportunity" of the American Congress of Surveying and Mapping. The Task Force and Commission 2 would like to discuss "The modern Profile of a Surveyor - new educational Contents for new Students". The Task Force Chair would like to organise one Task Force meeting during the Congress. The Task Force on Under-represented Groups in the present shape was established 1998 during the FIG Congress in Brighton. The limited time period will end in 2002 with the FIG Congress in Washington. The Task Force is a network of currently 56 members from 22 countries with many contacts to colleagues and a good co-operation with UNCHS (Habitat) and other international and national associations in the technical field. The participants of the Workshop reflected all Task Force activities like networking, publishing Best Practises and giving recommendations on FIG and national level. The proposal was that the Task Force time period should be extended or that the Task Force should get a more permanent structure. Activities concerning equal rights for individual members within FIG, not depending on Gender, age, native language or some other cultural characteristics will also be necessary for the next period 2002 to 2006. In correlation with the report of Gabriele Dasse concerning the Task Force "Review of Commission Structure" the participants of the Workshop proposed that there should be at least one woman in all FIG Nominations Review Committees. In session 19, "Curricula II - How to Manage and Keep the Curricula Contents Up-to-date? ", the Task Force Chair presented a paper "Which Changes in the Curricula do we need to attract more Women to study Surveying?". Among other things decreasing numbers of students beginning surveying studies at German universities has led to changes in the curricula of some universities from surveying to geomatic, geoinformatic or geoinformation. A lack of students, male students, may necessitate activities designed to attract as well more women into studying surveying. But up to now there has been no evaluation of the target groups which should be addressed by this new curricula. During the General Assembly on Friday the Task Force Newsletter 1/01 was distributed to all member associations and there was the opportunity to give a short report about the Task Force activities in Seoul. The World's Women 2000: Trends and Statistics is a unique compilation of the latest data documenting progress for women world-wide in six areas: health, human rights and political decision-making, and families. The Report attempts to answer the urgent but complex question of the progress the world's women are making in their lives. The Report stresses that new data is needed on issues unique to women - such as violence against women and maternal health. The World's Women 2000 is the third in a series of reports that has broken new ground and the data in the present publication is intended to provide a "snapshot" of some of the more salient statistical findings since 1995, while also drawing recent changes and long-term trends. This revealing book remains the most complete description to-date of women's conditions and contributions world-wide. You will find more information on the web site http://www.un.org/Pubs/update/womupd.htm. For the first time women in Senegal got the right to buy and to own land. This right was established with the new fundamental law of the State, which was adopted by the predominantly Islamic people of this West-African State. In many African countries the acquisition of land and the opportunity to receive credits is reserved for men. Dr. Clara Greed is a Reader (senior researcher) in the Faculty of the Built Environment, University of the West of England. She originally qualified as a town planner and is a member of the RTPI (Royal Town Planning Institute) and is a Fellow of the Architecture and Surveying Institute. She started her career in local government and then moved on to teach surveying students in Bristol. With the growth of the 'women and town planning movement' in the 1980s she felt led to make comparisons with the situation in the surveying profession. Subsequently she undertook her PhD on 'The position of women in surveying education and practice' which was published in 1991 as the book, Surveying Sisters: Women in a traditional male Profession (Routledge, London). She became more involved in equal opportunities issues and in researching the built environment professions, and in 1994 her book, Women and Planning: Creating Gendered Realities was published by Routledge, London. Following this she has produced a series of town planning books and her interests moved more towards social planning issues. 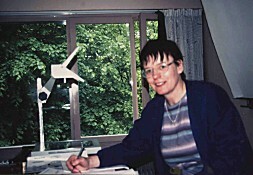 From 1997 she undertook ESRC (national research body) funded research on the The Changing Composition and Culture of the Construction Professions (published as a Faculty Occasional Paper) which her moved back from the 'soft' areas of planning and urban policy, towards the 'hard' areas of civil engineering, construction management and building surveying. At the same time she became more interested in urban design issues, thus looking at 'what is built' as well as 'who' is building it and who is making the decisions that shape the nature of our towns and cities. In association with Marion Roberts, an architect at University of Westminster, she has produced two books on urban design (published with Pearsons). In recent years she has put more emphasis upon detailed design issues and upon the problem of actual implementation of change. There are nowadays many books and analysis as to what should be done, but very little action and policy implementation. Clara is a member of several national committees concerned with the construction industry, education and equal opportunities including the Equal Opportunities Taskforce of the Construction Industry Council which is pressing for change right across the fields of surveying, architecture, engineering and planning. Currently with Linda Davies (planner), Caroline Brown (planner) and Stefanie Dühr (environmental researcher) she is undertaking a nationwide Gender Audit project for the RTPI to investigate the extent to which Gender mainstreaming (as required under EU structural funding) is being integrated into the British Planning system. Her team are also producing a Gender Audit Toolkit to enable local authorities to do so. With Isobel Daniels (researcher) she is undertaking a pilot study as funded by the Nuffield Trust (national research foundation) to investigate the differences in user and provider (manufacturer) perspectives on public toilet provision! This is because everytime she does research on the planning of British cities, women in particular, want to talk about the day to day problems they encounter in the city of man, saying, 'it all comes down to toilets in the final analysis'. This is a serious issue as it affects people's access and enjoyment of the city. In Britain there is not a tradition of privately provided toilets in shops and cafes, so public toilets are often the only ones available, but councils are closing them to save money and prevent [male] vandalism and criminal activity. Thus she has encountered the world of the 'plumbing fraternity' and the 'sanitary engineer' which are subspecies of the construction industry that are even more male-dominated and socially unaware than those other species she has encountered within civil engineering, town planning and surveyors. She has been an invited speaker at international public toilet conventions in Japan and the Far East, as public toilets are a global issue because of increased tourism, Third World development, environmentalism and population change. There is a growth in demand for improved provision for women, children, people with disabilities and the elderly. She is currently writing a book for The Architectural Press: Inclusive Urban Design: Public Toilets for All which will cover overall policy issues and specific design considerations. On May 9, Jonathan Harris and Shirley Conran hosted an event to highlight the future role of women in British property and construction industries. Harris is President of the Royal Institute of Chartered Surveyors (RICS), and Conran is chair of the Work-Life Balance Trust. RICS represents over 110,000 chartered surveyors and technical surveyors. According to Harris, "Any profession worth its salt wants to recruit talent from the broadest base possible. We need to find out why we are missing out and what we can do about it." The special session explored reasons for the low proportion of women working in property industries. Also examined were steps required to redress the situation. Only 8 percent of practicing chartered surveyors are female, although women comprise 16 percent of those in training. This compares with 9.5 percent of practicing architects, 13 percent of chartered accountants, and 36 percent of solicitors (lawyers). The breakfast meeting was attended by a high profile audience of senior industry figures from major firms. Also in attendance were representatives from the Department for Education and Employment and the Equal Opportunities Commission. 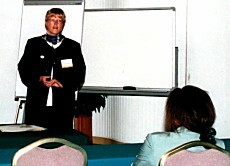 Norma Jarboe (from a proactive organization called Opportunity Now) made the case for more women in influential positions in the workplace. "Diversity leads to better decision making and better problem solving," she said. "In today's diverse markets, any form of corporate monoculture will be a weakness." Kate Howard from the Construction Industry Training Board recounted the need for a solid education and career strategy to recruit females into the construction industry. Little over 1 percent of British trade and crafts workers are women. Sandi Rhys of Rhys Jones Consulting made a compelling presentation which drew on her thirty years of experience in the industry. "Five years ago you could clear a room in two minutes by talking about getting women into the construction industry," Rhys recalled. "Things have improved, but whereas then the lack of awareness was the stumbling block, now we have to address lack of action." A debate followed, pointing out the need for organizations to provide role models to showcase the industry's success stories. Julie Mellor, chair of the Equal Opportunities Commission talked of the importance of removing the element of risk for executives who are courageous enough to take affirmative action in this area.